Kraków is a remarkably city. It’s the surprise card of a three-week trip through Central Europe. Elegant and stately 18th and 19th century buildings line the narrow streets while the huge market square dominates the center of the old city. The manageable size of the city, the ease of getting around on foot, and the palpable creative and youthful energy one senses makes Krakow a great place to visit. Krakow. Market Square on a sunny Autumn day. The main square, Rynek Główny in Polish, dates back to the 13th century: at 9.4 acres in size, it is one of the largest medieval squares in Europe. This space is overpowering, hypnotic and graceful. It is irresistible at any time of the day, and with this size, never gets too crowded. 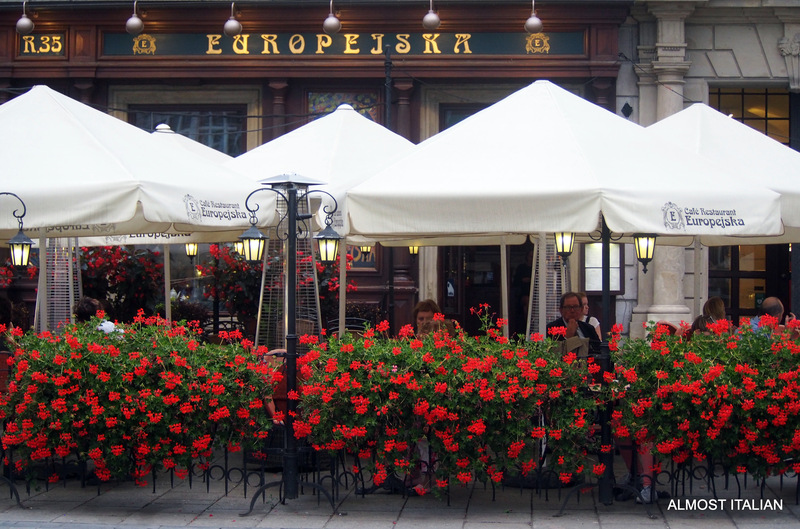 Often main squares in European cities are best avoided in peak times, especially in the tourist season. The square is surrounded by historic townhouses, churches and the central Cloth Hall, rebuilt in 1555 in the Renaissance style. 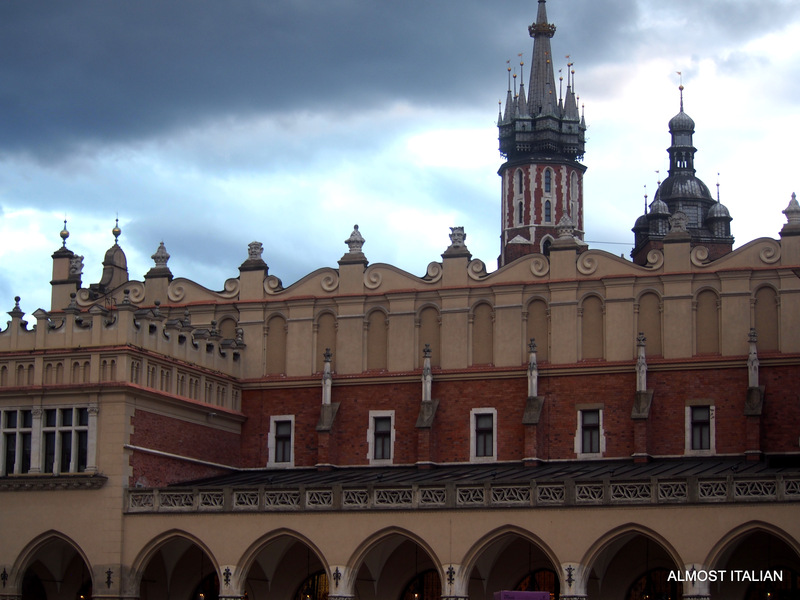 The cloth hall today has small tourist shops selling Polish themed trinkets. The building is long, rectangular and graceful. Other buildings edging the square, include the Town Hall Tower, the 10th century Church of St Adalbert, and many restaurants covered by market umbrellas along with heavy-duty heaters. 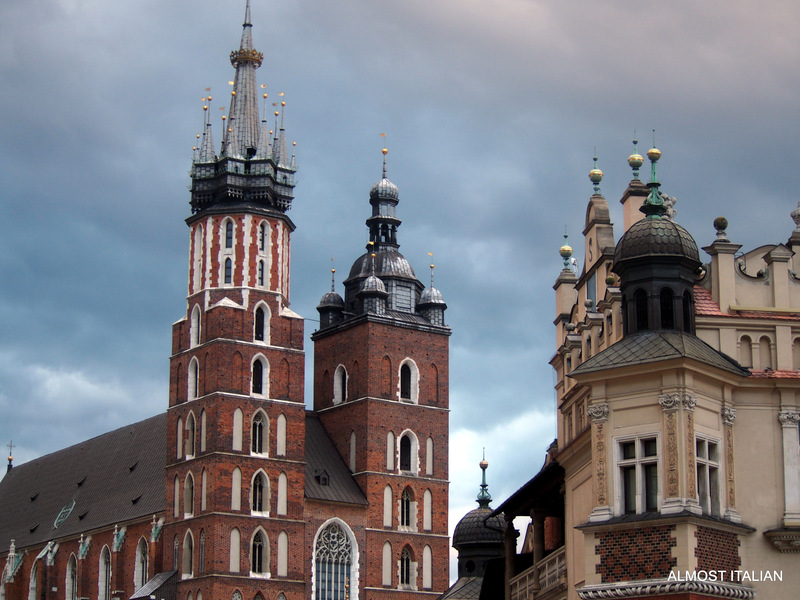 Historically, Krakow has been one of the leading centres of Polish academic, cultural and artistic life. It enjoyed its golden era during the 15th century, with Renaissance artists and architects flocking to the city. 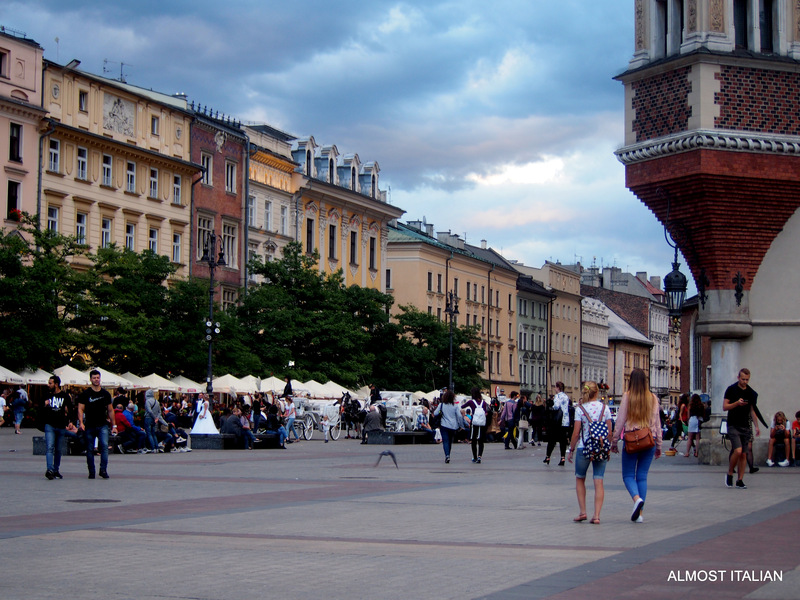 Despite the horrors of WW2 and the Nazi occupation of Kraków, followed by Stalinist control of all intellectual life, Krakow has, in the 21st century, re-emerged as a place of culture and education. In 2000, Kraków was named European Capital of Culture. In 2013 Kraków was officially approved as a UNESCO City of Literature. There are 250, 000 tertiary students in the city. 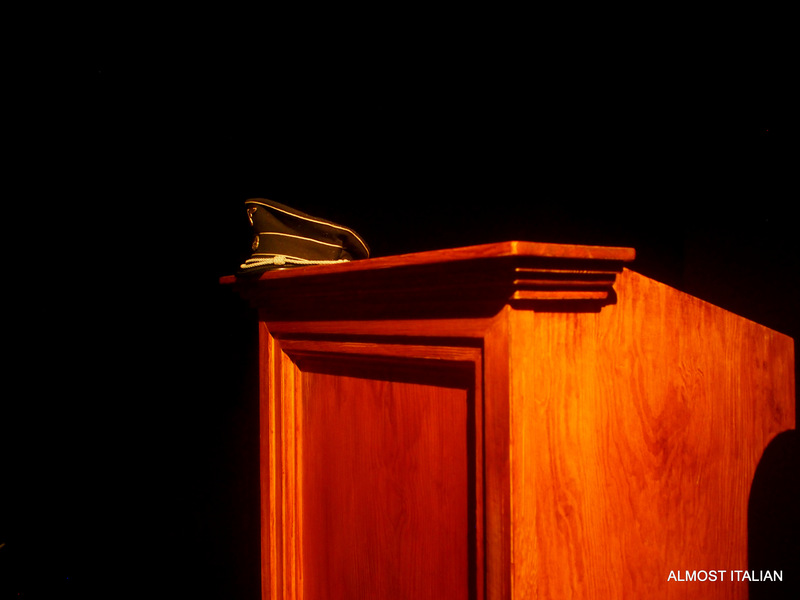 Music venues are thriving, as well as the arts and literature. You can feel the energy in the streets. The central market square attracts excellent musicians and buskers at any hour of the day. After the Nazi invasion of Poland at the start of WW2, Kraków became the capital of Germany’s General Government. The Jewish population of the city was forced into a Ghetto, which was later walled in: from there, they were sent to German extermination camps, at the nearby Auschwitz and Birkenau. 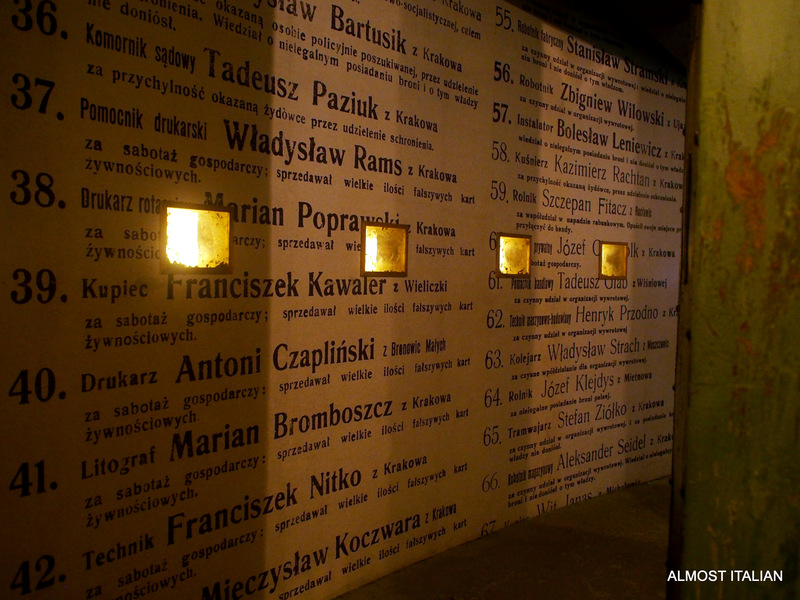 During that short period, 65,000 Jews from Krakow were murdered. 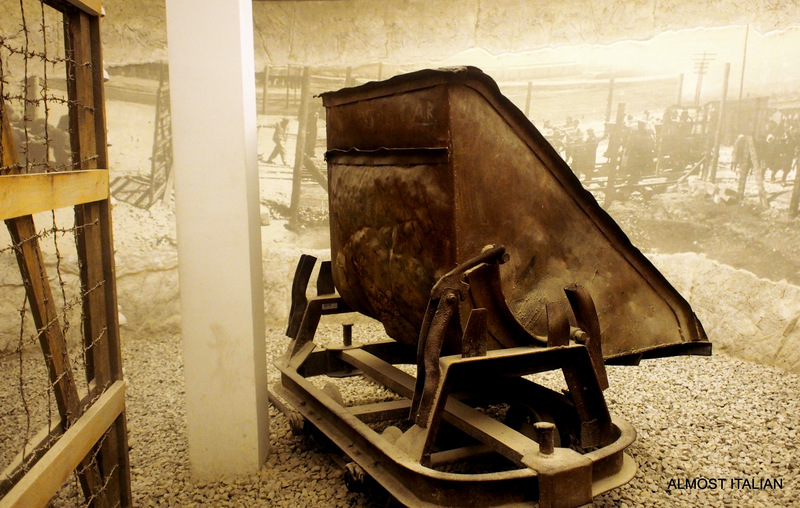 The reality of this horrendous evil is reinforced through a visit to Oscar Schindler’s Enamel Factory in Krakow, a museum and exhibition of life in Kraków under Nazi occupation 1939-45, housed on the former site of Schindler’s factory. A visit to this display, which will take around two to three hours, is a must. Catch a taxi to the factory and buy tickets there. There is no need to go with a group or a guide. 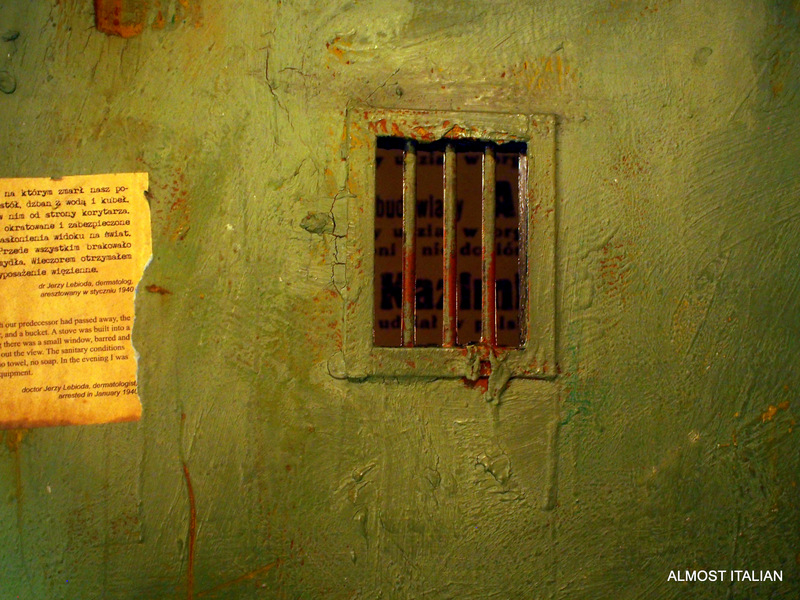 Warning: the exhibition is deeply moving and disturbing. The following photo collage is a media file, which opens as a slide show, depicting a few images from this museum. There are also tours of Nowa Huta, a separate district of Krakow, and one of only two planned Socialist realist settlements or districts ever built and “one of the most renowned examples of deliberate social engineering” in the entire world.¹ A tour with Walkative Tours of Krakow with a guide well versed in the history of Stalinism, and its application in Poland, was available. But in the end, we chose the food tour, a great way to learn more about the traditional foods of Krakow. The gentle sound of clip clopping horses in the streets nearby the central square. 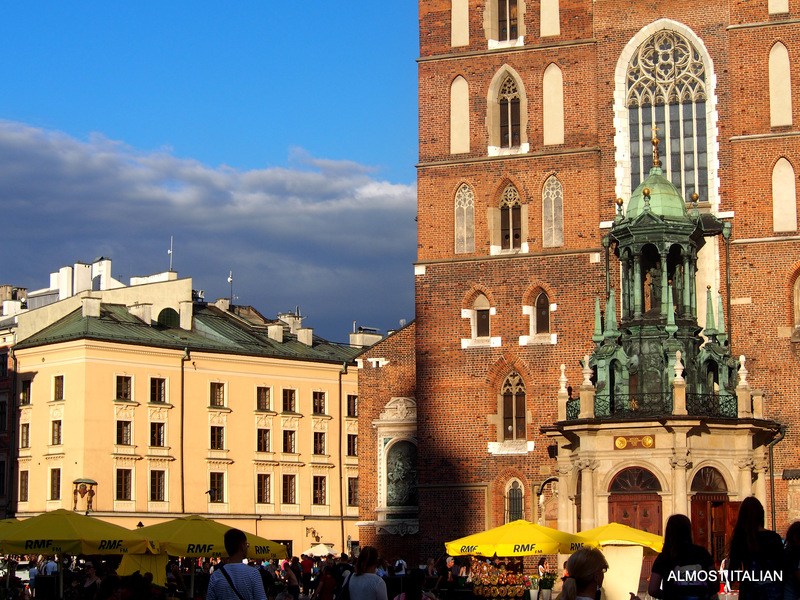 A UNESCO World Heritage site, modern Kraków is brave, proud, lively and welcoming. 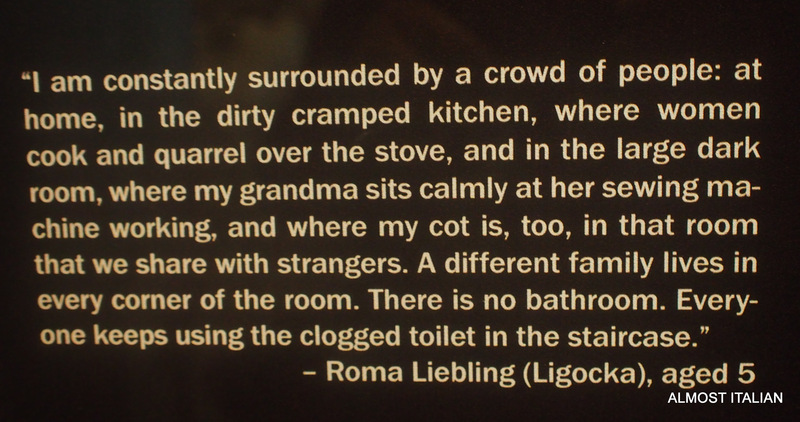 What a vivid and stark reminder that those atrocities occurred within some of our lifetimes – if not our parents. How forgiving Europe has become with the advent of the young being taught to rise to a better place and perhaps learn from the past. Your words and images and their vibrancy lend themselves to believe that this is the case. How sad to note that there has never not been warfare in the world since. What of the future? Let “rocket man” from North Korea and the “madman” from the United States speak for us all – we think not – but what can we do to stop the childish egos of despots and billionaire self proclaimers who hate name-calling! Now that is a question that we are all pondering, and one that even the professional diplomats find it hard to answer. I am sure similar questions arose in the hearts of many Germans during the rise of Hitler. That sense of political impotence in the face of an impending world crisis is disturbing and frightening. Hi Sistra – we might have to dig out Nostradamus’s messages to find out the answers. Sure doesn’t look too good for the Pacific region. Would hate to be in Hawaii right now! So very true Francesca, but with the rise of these hideous political power-mongers comes the negative side of modern technology. Push a button and billions of innocent people are evaporated or suffer long-term health consequences – let alone being displaced. On the brighter side we can only pray that there are other “powers” in the world that WILL put a stop to this insidiousness. 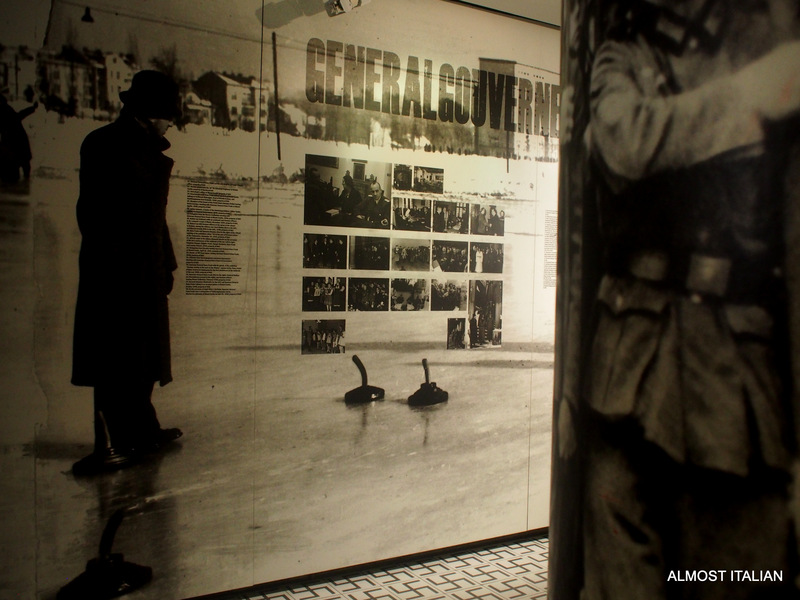 The description and photos of what occured during the Nazi occupation are harrowing. I feel like they are something everyone must see howecver to comprehend the scale of their horror and as an example of why they must never happen again. This aspect and the post as a whole have inspired me to visit however, it sounds like a must to visit both historically and for it’s contemporary state. Certainly a place now on my list! Thanks for your comments. Yes, on both counts, it is an important place to visit. Also the food, the people and the culture of the town makes it well worth the visit.I do hope you get there one day. Not sure how to reply, but thanks. It’s not my fave bit of writing, but then ,as we move along, some are written in trains between big cities, surrounded by a few drunks, others in low light, and so on. A travel diary of sorts. I like to write often, and so some are naturally better than others. Sorry it was clumsy attempt to say I really enjoyed the piece. You really got the picture across well and with passion. I have no idea what I’m writing most of the time or saying for that matter. You’ve know this about me. And right back to you big sis. Much of Eastern Europe suffered like Krakow: you are talking of my early childhood wherever Germany and Russia pushed us back and forth. What could a small child understand of the nightly bombs and rapes and murders as everyday events. Hence the ‘today’ picture thrills – above all the 1/4 million university students in a city not all that large . . . culture, literature, music . . . . dear Powers Above, may it so remain for a long time . . . . Yes, Krakow’s war experience is a a microcosmic picture of what happened right across that region. For me, visiting for the first time, I could made more sense of it all- not just a university study, an academic understanding of things, but being able to feel that awful history and sorrow, and happily too, appreciate the depth of culture and refinement that was present in the past and has now returned. If that makes sense. What beautiful buildings, Francesca, and it sounds so vibrant. Is University education expensive there? 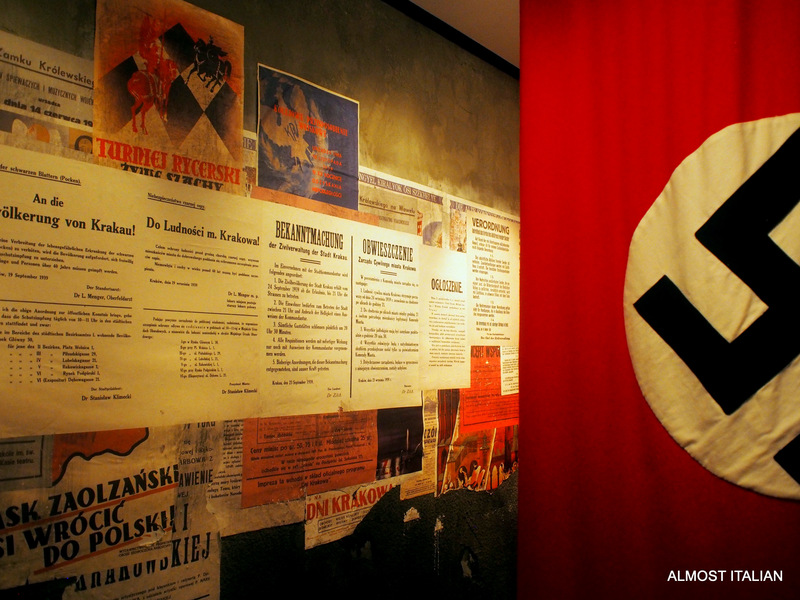 I took a guided tour of the Jewish Museum in Sydney recently and apart from learning more about the traditions within the religion, the holocaust exhibit was extremely sobering. I thought I knew a fair bit about what happened in those years but it still made me gasp. When I think about it, those events were the result of Hitler promising to make Germany “great again”. My mind could only take so much reality and after a couple of hours I had to leave, but I should like to go back again. I wasn’t aware of the Jewish Museum in Sydney. Must get there one day. It is hard when confronted with such horror. The worst thing I saw was a picture of 5 dead Polish men hanging from ropes,while below were two Nazi uniformed young men laughing and clowning about as the photo was taken. We always think it can’t happen happen again. Beautiful views of a beautiful city. Although the proximity of the extermination camps nearby put a damper on one’s enthusiasm. But, history is history and it should be remembered. Sounds like my sort of place. 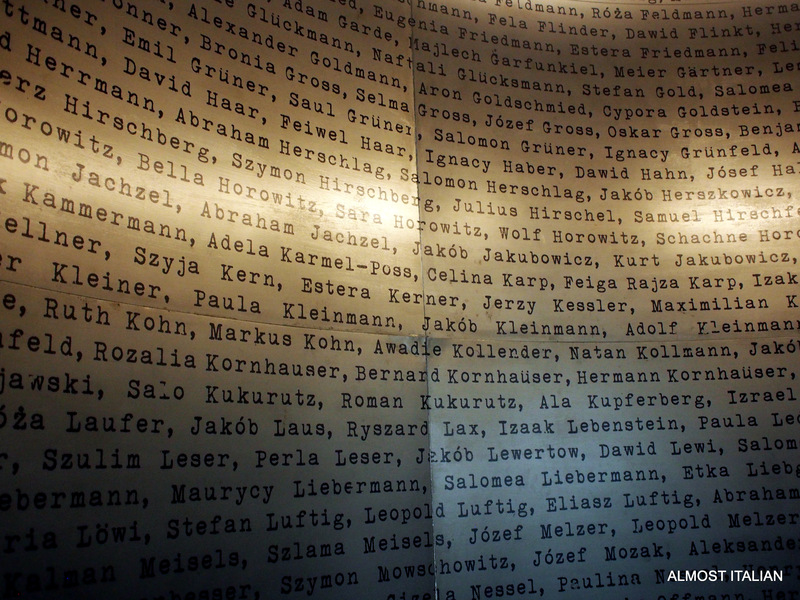 I chose not to visit those camps, but Schindler’s factory is really worthwhile. Yes, History must be remembered to remind us all that Nazism and Fascism can appear again.. meanwhile on a positive note, the town is vibrant and beautiful, you would love it Debi. Thanks Julie. 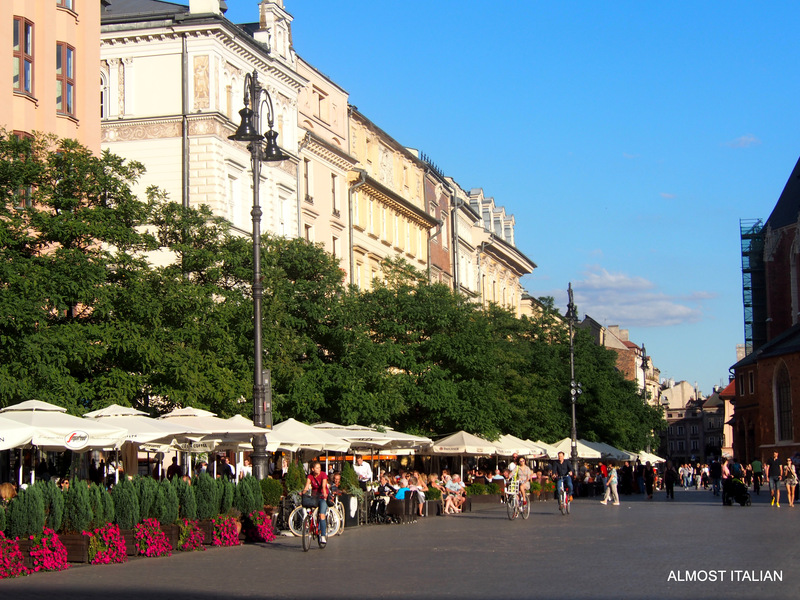 Krakow should be on everyone’s list. What an interesting post! 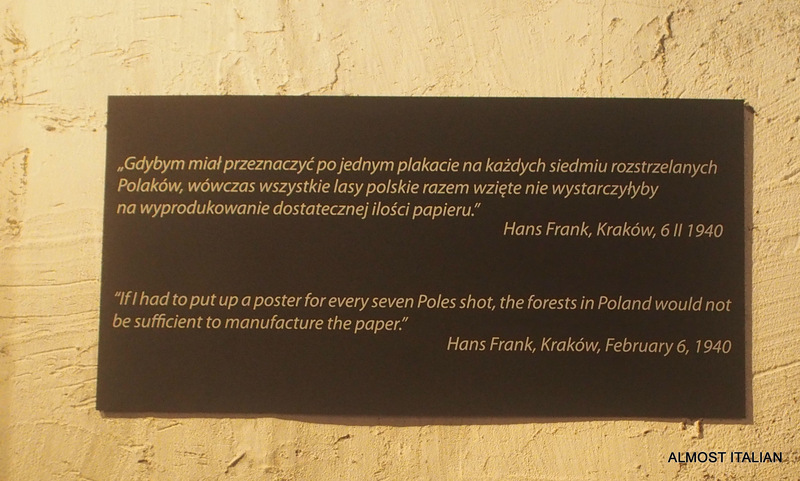 I visited in November but was really bad at finding out much about the history, apart from at the Auschwitz Camp. I wish I had gone to visit Schindler’s factory, but I just didn’t have enough time! Loved Krakow and look forward to returning. Nice photos on your blog Lizzie.